New rocket will be able to carry payloads up to 70 tons. Testing is underway at the Plesetsk Cosmodrome in preparation for launch of Russia’s new Angara rocket, according to the press service of the Russian Ministry of Defense. The tests began in late July and will last three months. Upon completion, the Angara should be ready for liftoff. Russian technicians are conducting a full set of electronic and pneumatic tests of the equipment, using a prototype of the Angara. The Angara space rocket project began in 1995. 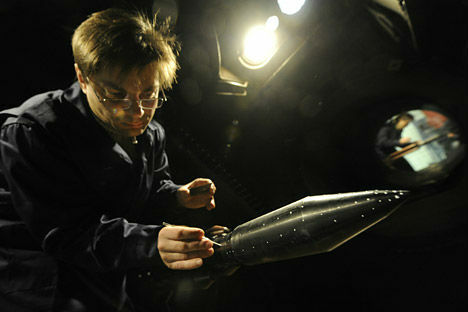 It is geared to use at cosmodromes located within Russia and is being produced using Russian-made components. The system will be able to handle light, medium and heavy launch rockets. Development of the first flight-capable launchers, the light Angara-1.2 PP and the heavy Angara-45, is under way at the Khrunichev Center. Flight testing is slated to begin in mid-2013. The Angara family of rockets is a new generation of launch vehicles, based on a universal rocket module with oxygen kerosene engines. The range of rockets under development will be able to lift from 1.5 to 25 tons into low Earth orbit. But, as Russian media have already reported, Russia will use the Angara as the basis for a superheavy rocket, capable of launching manned flights to the Moon. The payload capacity of the new superheavy rocket will be up to 70 tons. This will make capable of carrying heavier payloads than any other system in use today, but it will fall short of the record set by the Russian Energiya system, which was capable of carrying payloads up to 105 tons. That rocket was intended for launching the reusable Buran space shuttle into low orbit. In September 2011, the United States announced plans for a heavy launcher called the SLS (Space Launch System) to handle payloads of up to 165 tons. The cost of the project is $35 billion, of which $18 billion is planned for allocation during the next five years. The U.S. Saturn-5 launch rocket, which made NASA’s manned flights to the Moon possible, could put up to 130 tons into orbit. The first model of the SLS, however, will likely be able to deliver payloads of no more than 70 tons. The Americans plan to conduct a test launch of the superheavy rocket no earlier than December 2017. First publihsed in Russian in Rossiyskaya Gazeta.